We visited Rusty's RV Park for two days in December. 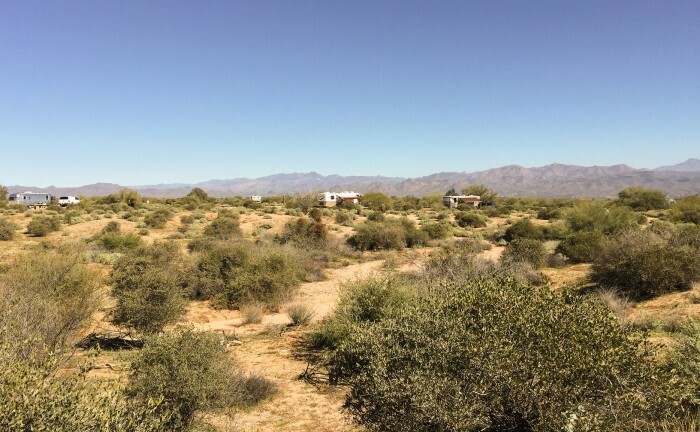 It's about 20 miles off the Interstate, in a pretty isolated, desert area, with nice mountain views. The campground itself is pretty nice, but the interior roads are dirt and were pretty rutted/bumpy (e.g. deep, hardened tire ruts from what was probably a rainy/muddy season). Our site was at the end of a row so we had tons of space on our camping side, but rigs are parked next to each other facing opposite directions with shared utilities in between, so we had a rig very close on the driver's side. There's no AT&T service at all, and we were only able to get 3G on our Verizon. Fortunately, the free campground WiFi worked pretty well for the basics (e-mail, social media, maps, etc.). The price was a little high for basic amenities ($32 with tax), and while they offer a 50% discount for Escapees members, it's only usable for 3+ night stays. Since we stayed for two nights, we actually paid more ($64) than we would have if we'd stayed for three ($48) which is a strange way to do business. It was very quiet during our stay. Also, it was fairly windy each afternoon. We'd stay here again if we ever return to the area, as long as we don't need high speed internet/cell service. We camped at Rusty's RV Ranch in a Motorhome. This is a large, well kept RV Resort just west of Albuquerque. We were there at the beginning of winter so the park was mostly empty. We camped in the new section (north-east side of the park) which has no grass, just gravel/rocks, but had long, level, pull-through sites. 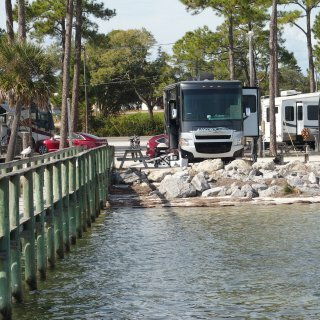 Although sites aren't exactly spacious, they have decent separation for a commercial RV Resort. There is a small dog park, but we mostly walked around the RV Park since it was big enough for us to get decently long walks. The web site boasts "Upgraded Free High Speed WiFi" but even though the park was mostly empty, we found the WiFi to be pretty slow. AT&T and Verizon worked well, so we used our hotspots instead. There's a pool, hot tub, and other amenities (which we didn't use). Overall the park is very nice compared to other options in the area, though you do end up paying more for that higher quality. We'd stay again. We camped at American RV Resort in a Motorhome. 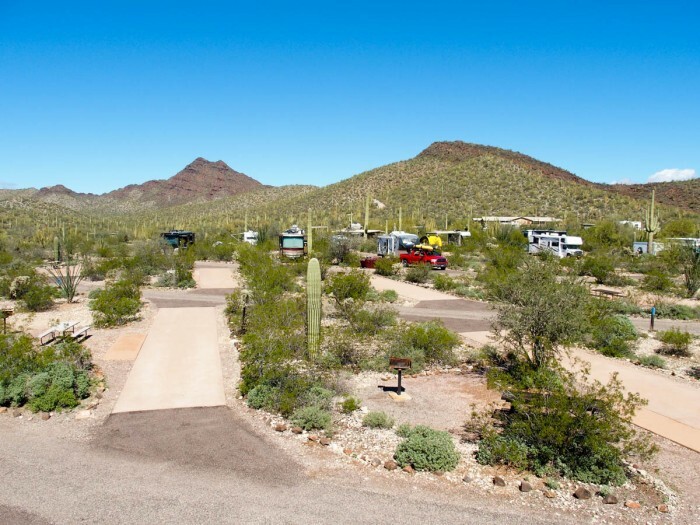 A small, self-service, "no frills" gravel RV Park right off the interstate. There are a handful of 50-amp sites and the rest are 30-amp. Tree branches prevented us from getting into a couple of the 50-amp sites with our big rig but we found one that worked for us. There was only one other RV there during our overnight stop. Highway noise is noticeable but not too bad. AT&T and Verizon work fine. We paid full price which even at $28 felt a bit high for what you get, but if you have Passport America the price is very good. I can't picture staying here more than one night, but as an overnight stop it is perfectly fine. 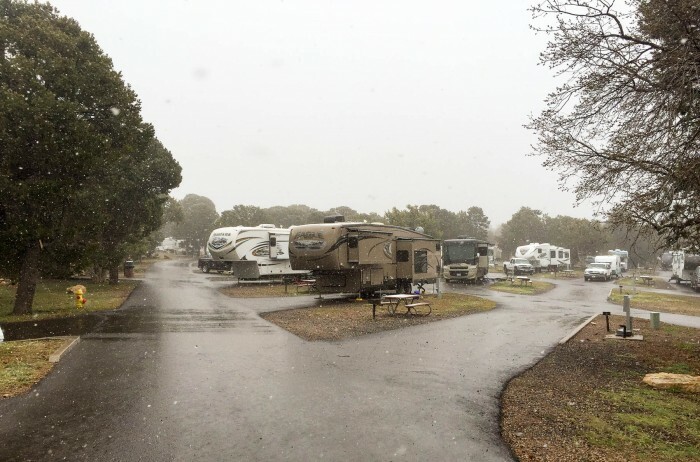 We camped at Double D RV Park in a Motorhome. This was a typical KOA, lots of sites in neat rows. It is nicely wooded which helps the looks and feel quite a bit. We found it to be a bit pricey ($50 including tax and KOA discount, for the cheapest pull-through site). Check-in was fast and friendly, and our site was level. We had good Verizon and AT&T signal, but Verizon was extremely slow (AT&T was fine). We were only here for two nights and it was below freezing the whole time so we didn't get out to see much of the campground. We'd stay again for a night or two while passing through. We camped at Terre Haute KOA in a Motorhome. 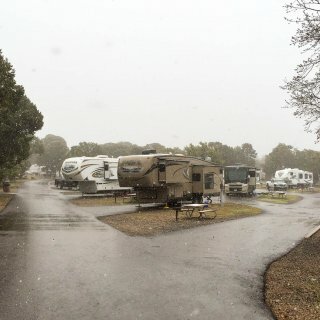 This is a mobile home park with around 5 sites for RVs, however it was exactly what we needed: a place to spend the night while traveling during a snow storm in November. Everything else in the area was closed for winter, but we called ahead and fortunately got a site here. Staff was accommodating and helpful. 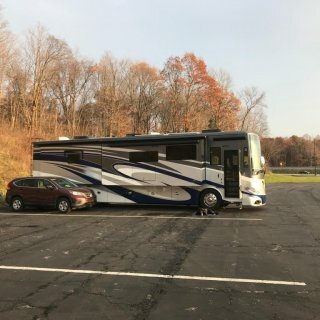 Our 40-foot motorhome and car just fit (after disconnecting our car -- back-in site). Our site was relatively level, but the site next to us low in the front. It's a fair distance from the Interstate but easy to get to. Since we were just here overnight we don't have a lot to say, other than it's a fine place for a couple night stay in an RV. AT&T and Verizon worked fine. 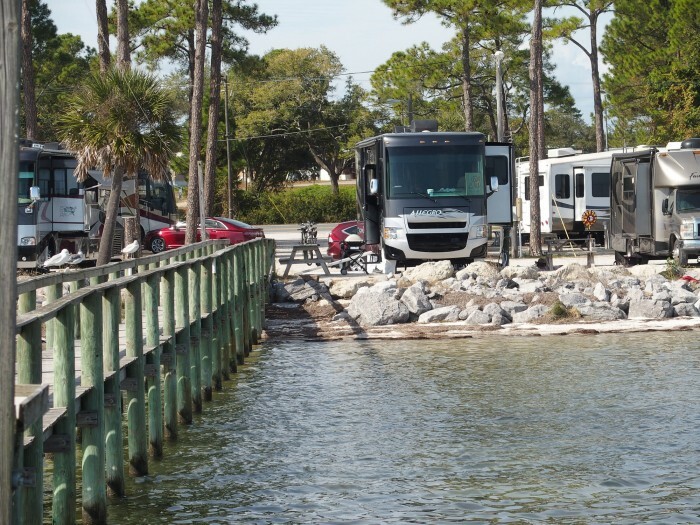 We camped at Maple Ridge & Crabapple Cove in a Motorhome. We were traveling in late November and every RV Park within 30 miles of the Interstate was closed for the winter, so we opted to overnight here. Since it was snowing and freezing, we were glad to have 50-amp electric hookups to keep our heat working and our batteries charged overnight. Our 41-foot motorhome with four slides easily fit in the site, with our tow car parked alongside. Things would have been snug if we had neighbors but we were alone. Our site was completely level, and the 50-amp power worked well, though voltage was a bit low (~112V) when we had multiple appliances running. It's an Interstate Rest Area, so there isn't much to say other than it was convenient, not too noisy, and got the job done. There's a free dump station and fresh water fill as well. We refilled our diesel at the Rest Area before leaving in the morning. The only inconvenience was the need to unhook our car and back into the site. 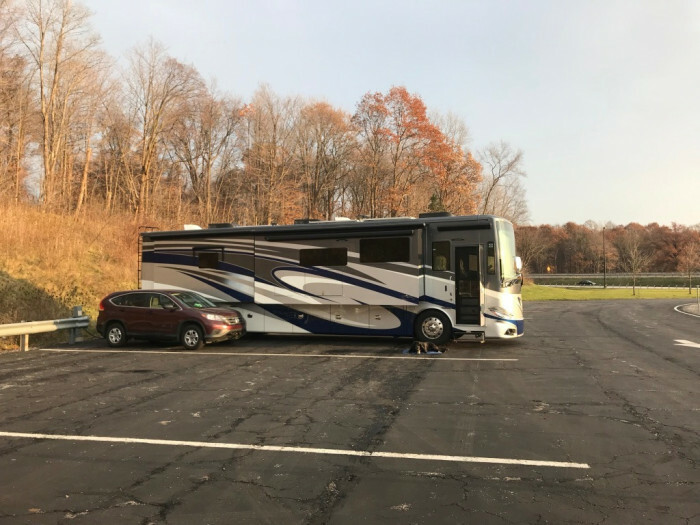 We camped at Ohio Turnpike - Portage Service Plaze in a Motorhome. This was an OK campground but our site was not great. It's important to note that there are several sections which are vastly different. We were in the full hookup pull-through section which is just some gravel spots in an open field. 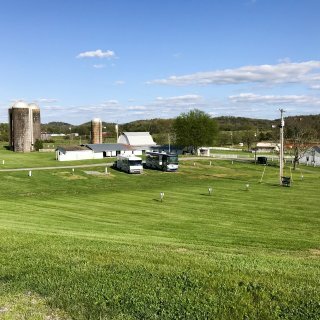 The sites are very close together, they face in alternate directions (so you share your camping area with your neighbor), and are on a bit of a hill so it's pretty hard to get level front-to-back. Overall our site was not great but was OK for the few days we were there. There's another camping section further back that doesn't have full hookups, but feels more like a state park campground - heavily wooded, pretty, and natural. The long driveway from the main road to the camp office is narrow (one lane) but newly paved and smooth. We did run into an outbound car on our way in, so the car had to back up to the camp office so we could get by. The road from the office to the full hookup sites is in poor condition (narrow, uneven, and rutted) but manageable. We had good AT&T and Verizon signal, and found plenty of places to walk our dog thanks to the wooded camping area behind our area. We'd stay again in a pinch, but prefer a couple county parks in the area. 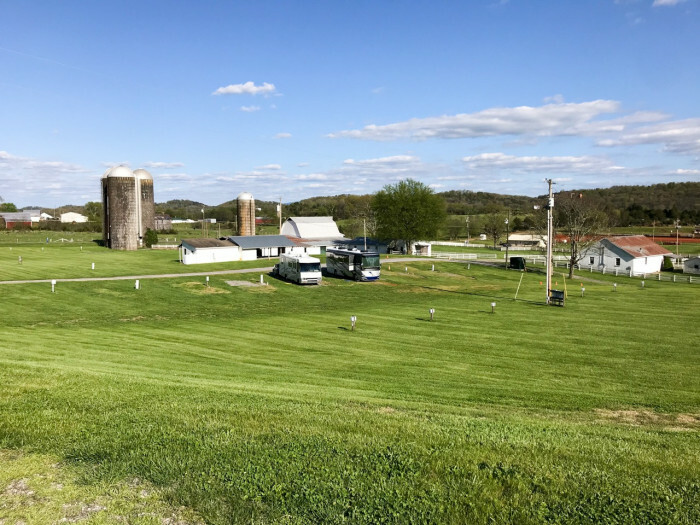 We camped at Greenville Farm Family Campground in a Motorhome. We only stayed here overnight while on the road but were very happy with our stay. Check-in was easy and friendly, and our pull-through site was fairly level and plenty long for our motorhome and towed car. There are some steep hills on the short drive to the campground, and very steep hills inside the campground. 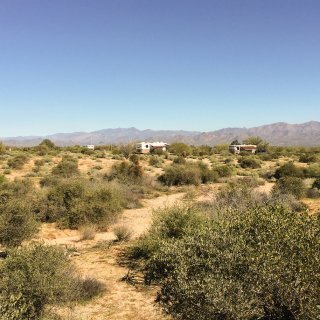 Fortunately we were able to avoid the very steep hill inside the campground by following the owner's advice and driving into a different area, turning around, and heading back through our pull-through site and out the entrance. This is a very small campground, so there are not many places to walk our dog, but the price was great and we'd return here for another overnight in the future. Since it's so small, reservations are recommended. Verizon and AT&T both had strong signals but data was a bit slow on both. We camped at Rocky Top Campground in a Motorhome. We only stayed overnight so didn't see much of this relatively small campground. Location is very convenient, right off the interstate. There isn't a check-in parking area, but when we pulled up with our big motorhome, someone came out of the office and told us which site to go to, and we went and paid her after getting set up. Our gravel pull-through was easy to get into and very level, and utilities worked well. AT&T and Verizon both worked well. We knew going in that the park is not dog friendly, and the many warning signs about immediate eviction without refund for any infraction (e.g. dogs can't pee on any plants, shrubs, etc.) reinforced the fact. 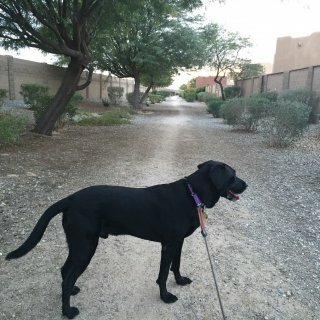 We found a few local neighborhood streets to walk our dog on, which was fine for an overnight stay. Despite the dog situation, we'd stay here again overnight if the location is convenient, but wouldn't stay more than one night. For those without a dog, the park might be a little better. We camped at Grandma's RV Camping in a Motorhome. We stayed here one night and found it perfectly acceptable, about average/typical for a KOA. As expected, sites are pretty narrow with a strip of grass between each. Ours had a raised wooden patio, which looked nice, but meant we couldn't open our motorhome's cargo bay doors because they'd hit the patio. The campground had lots of amenities (pools, sports, etc.) which we didn't use. There's a pretty noisy train that comes through fairly often, but didn't bother us while we were inside our rig. The campground was mostly deserted during our visit just before Labor Day. One part of the campground near the bay was under water, but it was far from our site. Both AT&T and Verizon worked well. For an overnight stop, it was perfectly fine. We camped at Sandusky / Bayshore KOA in a Motorhome. 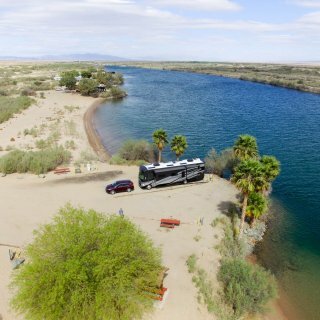 This is a very pretty state park, with a very large campground across eight loops. Three loops allow dogs, the rest don't. We were a little nervous about staying here in our 40-foot motorhome but we didn't have much trouble fitting it in, though we had some tight turns with scraping branches during our drive around the loop. Smaller rigs would be ideal in this park. Our site was long enough, but difficult to get level. Our loop (700) was paved, but many of the other loops were dirt/mud with huge ruts and potholes. We didn't use the bath house but it looked brand new. Since we could only walk our dog through three of the eight loops, we ended up walking along a hiking trail that cuts through the campground, which was quite nice. We got 1 bar of AT&T and 2 bars of Verizon, with both being very slow. We set up our WeBoost antenna and then had 3 bars on each and they worked better/faster than expected. We camped at Letchworth State Park in a Motorhome. We stayed for 5 nights which turned out to be a bit too long... the state park is small enough that you can see all the sights and hike a couple trails in just a couple days. The scenery and waterfalls here are impressive! This is a very small campground behind a motel. That said, the campground itself is fairly attractive, with plenty of trees and grass, a nice pool, and a tent area. There are only four full hookup sites, so we had an electric+water site for our 6-night stay. The dump station was easy to get to on the way out. Sites are decently spaced... not exactly spacious, but not right on top of one another. There are also some unavoidable low tree branches at the entrance. The main problem we had was that the sites are just grass, and we arrived after a day of rain, so our site quickly turned to mud as we tried to back our 40-foot diesel motorhome into it. We put down wood blocks under our tires and jacks and were able to get parked without sinking in too much but it was tricky, and when we left we had to dig our sunken wood blocks out of the now-solid ground. Adding some gravel to the sites would make a big difference. The gravel interior roads are nice and solid. The campground backs onto a paved walking/biking trail along a small stream, which gave us miles of walking options for our active dog. AT&T and Verizon both worked well. The free WiFi even worked much of the time, but was hard to get a strong signal from our site. We received mail/packages during our stay, but the motel office reeked of cigarette smoke and the person we interacted with was not particularly friendly. We'd consider staying again due to the price and bike path access, but will also research other options in the area that might be more big-rig friendly. 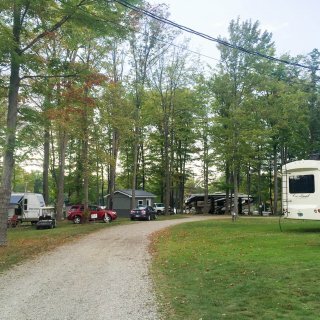 We camped at Whippoorwill Motel & Campsites in a Motorhome. The park is in a central location with easy access to Lake George and Glens Falls. 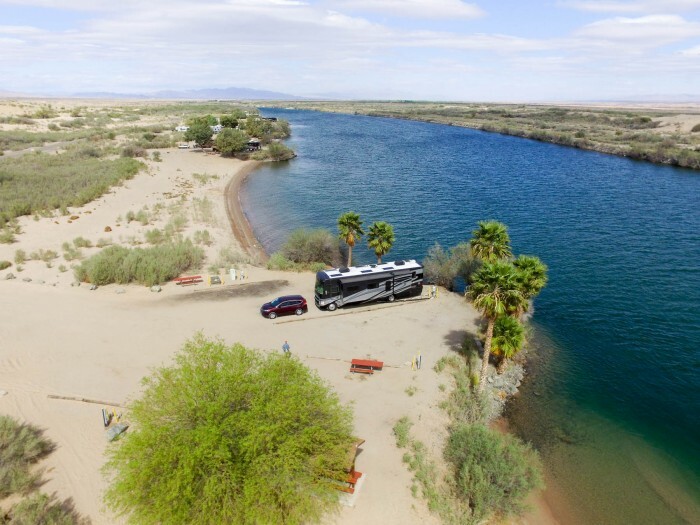 This is one of the largest, most attractive commercial campgrounds we've ever stayed at, with 100+ campgrounds under our belts. Most of the sites are rented seasonally, but all were very well kept, some with landscaping that would put most houses to shame. The campground is huge, but very hilly, with most sites carved out of the hills and then leveled. This means most sites are spaced pretty far apart, and many have very long driveways (100+ feet) to get to the level part of the site. We stayed for a week and were in one of a handful of pull-through sites which are, unfortunately, closer together, but still nice. Our site was the end of the row so we had a huge lawn on our camping side. There's also a small section next to the pool where sites are much closer together and not nearly as nice. 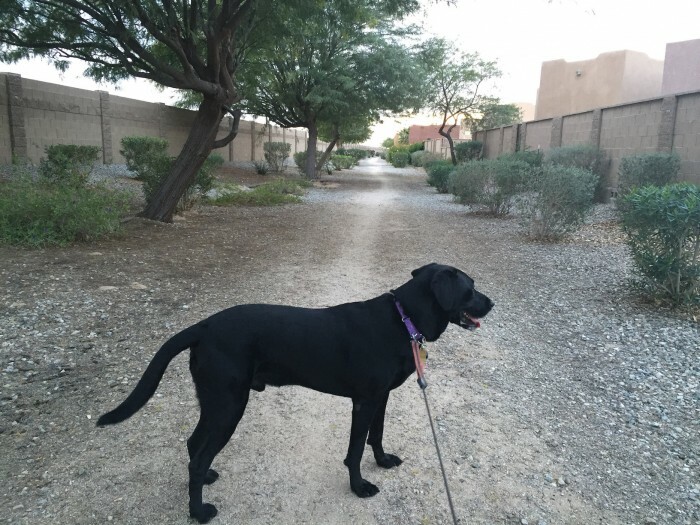 There were plenty of places to walk our dog inside the campground, plus there are trails within and adjacent to the campground. They have a very nice looking mini golf course, a pool, playgrounds, and more. We were able to receive deliveries at the office. The only downside for us was cellular connectivity. We had 2 bars of AT&T 4G at our site, but it was usually very slow. Other parts of the campground had no AT&T. We had 2 bars of Verizon LTE at our site, and sometimes it was fast, other times extremely slow. We'd return, as long as we don't get put in the cramped sites next to the pool. 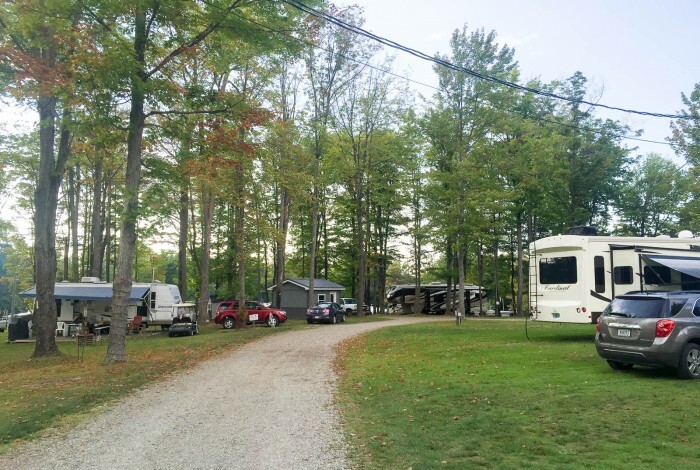 We camped at Sugar Ridge RV Village & Campground in a Motorhome. We stayed for a week, so our rate is based on the weekly discount. 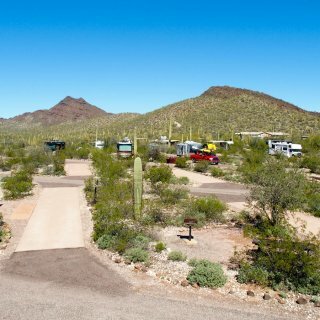 This campground was a little tough to rate, since it has some advantages and disadvantages. It is very rustic (which we like) and many areas feel more like a national forest or state park campground than a private campground. It's heavily wooded, and there's a great walking trail along the river where our Lab was thrilled to soak in the water every day. Be aware, there's a very steep downward slope on the first part of the trail that can be difficult for some. It's close to Gorham which has plenty of local stores, and a Walmart is a few miles further away. The staff/owners were friendly and helpful, and we were able to receive packages during our stay. There's a pool, hot tub, arcade, and playground. The campground is sandwiched between a rail line and US-2... the highway was pretty noisy, but the train was fairly quiet, though is likely more annoying if you are in the tent area which is right near the tracks. Most sites are pretty close together, and our site was extremely narrow for our big rig, with neighbors right next to us on each side. We had a couple days of rain and our site got quite muddy. Low voltage was a bit of a problem, but as long as we didn't use more than 25-30 amps at a time on each leg of our 50-amp connection we were OK. The free WiFi worked sometimes, but was often slow. AT&T was very weak but usable at our site near the office, but we had no AT&T signal in other parts of the campground (or even along the highway). Verizon worked well in the whole area. We took a quick look at the other campground down the road and much preferred the look/feel of Timberland, so if we return to the area, we'll stay here again. We camped at Timberland Campground in a Motorhome.